In a city like London where there are so many different types of people from all over the world, who perform so many varied job roles and functions in life, how is it that no matter where I am or what environment I am in, I can spot a chef in a crowd! I am not talking about the tense looking fella in the white jacket and check trousers. No, no, no, I am talking the person in normal clothes in a Pret or tube station for instance. This is not some Derren Brown related trick where I can see into the soul of someone or tell their mothers name by the number of times they twitch an eye brow or touch their ear lobe. It goes deeper than that. No matter what side of the industry we are in, be it restaurants, events, contract catering, hotels etc… we all share a connection. 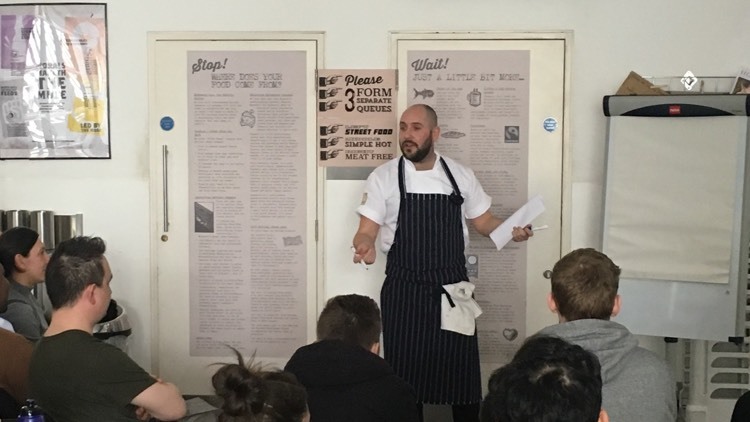 Darren, one of our development chefs recently ran a training course which tried to give an insight into his thought process when looking at ingredients or a project as a whole. This was a very interesting course as we tried to understand the ‘why’ of what we do, not just the what. Why does my brain or Darren’s go in to a particular direction when looking at a box of ingredients that might differ to other chefs in the company? Experience, exposure, or just confidence? We ran this in a very tangible way by getting a box of wonderful vegetables from one of the farms that supplies us, talked through our thoughts on them and then just started cooking. It is a very hard thing to put into any training document about how your brain works, so it is a lot more effective just to show it live. While looking into this with our chefs on the course we asked a question which a lot of people never really think about. Why do we do what we do? As the song says “we could have been anything that we wanted to be” (Bugsy Malone) so why this? I’m not going to tell you the answers that were given in detail, but they all came back to the want to make an enjoyable experience for people, to make people happy. So yes, we are all the same. Sometimes hard to deal with, sometimes say inappropriate things in the wrong environments, a few added scars and a willingness to be criticised in a way that no other sane person in any other job role would tolerate.